Can you ride off ramps? If your bicycle is specially adapted and has features designed to enhance durability and performance in rough terrain it is not just another bike, but is a mountain bike. And if you ride off-road, over rough terrain, down hill, dirt roads, then you are mountain biking. 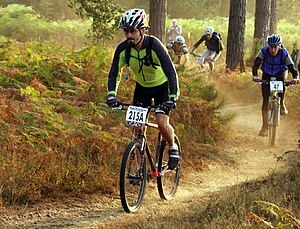 The vast majority of mountain biking falls into the recreational Cross Country (XC), and Trail Riding categories; and there are other categories as well: all mountain, downhill, freeride, dirt jumping and trials. 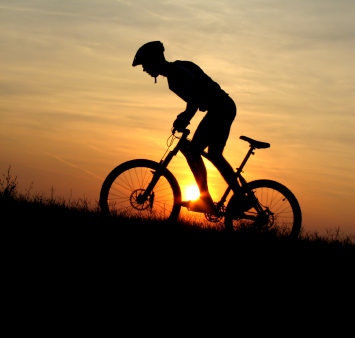 Mountain biking as a sport that requires bike handling skills, core strength and balance, endurance, and self-reliance. Some advanced mountain biking riders pursue steep technical descents while others do freeriding, downhilling, dirt jumping, and show off their aerial maneuvering skills by jumping off high ground and specially constructed ramps. Recently I saw this video of mountain biking by four young men – Dylan Dunkerton, Curtis Robinson, Kyle Norbraten, and Kyle Jameson, constructing their own ramps for jumping. I am very much impressed by their undaunted maneuvering skill of their mountain bikes.